Latinos made progress on household income, poverty and jobs in 2015 after years of little or no economic gains, but they have lagged in building personal wealth, according to a Pew Research Center analysis of government data. 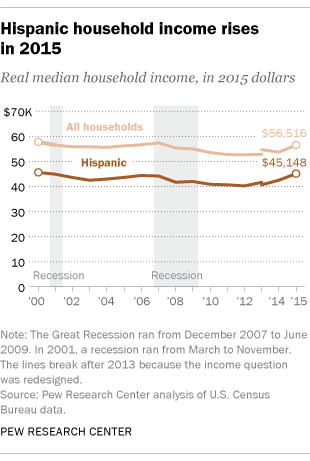 Hispanic real median household income was $45,148 last year, an increase of 6.1% over 2014, when median income stood at $42,540, the latest economic data from the U.S. Census Bureau show. Over the same period, the real median household income increased by 4.4% for non-Hispanic whites, 4.1% for blacks and 3.7% for Asians. Even so, Hispanics still trailed non-Hispanic whites ($62,950) and Asians ($77,166) by significant margins on this measure. 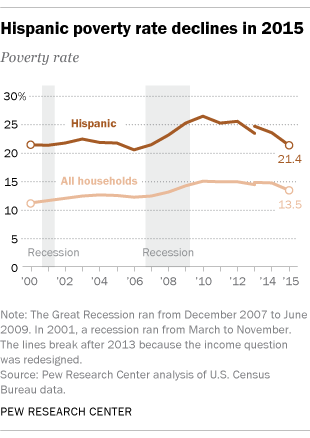 Hispanics also saw their poverty rate decline as household incomes rose. The Hispanic poverty rate stood at 21.4% in 2015, down from 23.6% in 2014, according to the Census Bureau. Non-Hispanic whites (9.1%) and Asians (11.4%) had far lower poverty rates than Hispanics in 2015, while that of blacks (24.1%) was slightly higher. These gains in income partly reflect an improved employment situation for Latinos. The Latino unemployment rate stood at 5.8% in the third quarter of 2016, down from 7.3% in the third quarter of 2014 and a peak of 12.8% in the first quarter of 2010. Nonetheless, Latino unemployment remains above its pre-recession minimum of 5.0% in the fourth quarter of 2006. While Latinos have made recent gains on income, poverty and employment, there has been little or no improvement in other areas. For example, the median net worth for Hispanic households in 2013 ($13,700) declined after the end of the Great Recession in 2009, and trailed far behind that of whites ($141,900), according to the latest U.S. government data. Meanwhile, the Latino homeownership rate, currently at 47%, remains below its 2007 peak of 50%. Latino registered voters rated the economy as one of the most important issues to their vote in this year’s presidential election, and the recent economic gains are reflected in the views they have about their own circumstances. In 2015, Latinos expressed growing optimism about their immediate economic future and rated their personal finances more highly than in previous years, according to Pew Research Center’s National Survey of Latinos. They have also remained upbeat about the economic upward mobility of their children. Roughly three-in-four Latinos in 2015 (72%) said their children will be better off financially than they themselves were at the moment. Only 5% said their children will be less well off in their lifetimes than they were. Correction: A previous version of this post overstated the current Latino homeownership rate.